Project obstacles and solutions: As part of the Ohio River Bridges project, I-265 was expanded from Indiana State Route 62 in Charlestown to the Ohio River in Utica, Indiana. The highway then crosses the East End Bridge into Louisville, Kentucky to link up with the eastern section of the highway. This will complete the I-265 loop around Louisville and grant relief from heavy traffic in the downtown area of the city. This part of the highway (Section 6) included paving 3.5 miles of previously uncut highway and building 15 new bridges. One of the biggest challenges for construction was the terrain of the area and traveling to job sites. The area is primarily made up of lowlands that are carved up by small creeks and seasonal wetlands. Moving heavy equipment into such areas is challenging. Construction passages were changed almost daily during the early work on the bridges to get around muddy trails that threatened to bog down delivery. As the footings, piers and caps were poured, IMI worked with Milestone to make adjustments to truck routes and spacing. IMI supplied 60,000 yards of concrete for the 15 bridges. Careful attention was given to the flexural strength of the concrete in the decks. IMI QC/QA designed a mix that was meeting a 6.2 -7.0 MPa at 7 days. This exceeded the 5.0 MPa that INDOT requires. Construction on the I-265 bridges was completed in May 2016. Traffic on the new stretch of highway is scheduled to open with the completion of the East End Bridge in the fall of 2016. 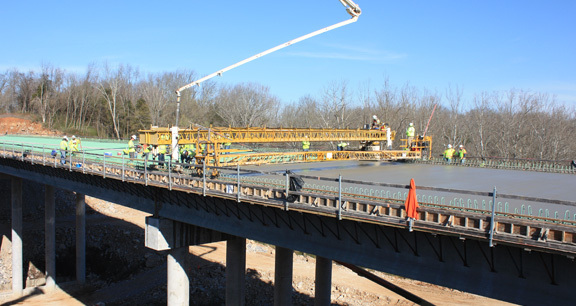 For more information on bridge construction, contact the sales representative for the plant nearest your locations. Click here.